The Nokia Lumia 920 is undoubtedly one of the best phones to get this soon. It offers colorful covers that are a nice break from the drab white/black/silver combinations that have saturated the market, top-tier specs, and an awesome camera all for a rock-bottom price. 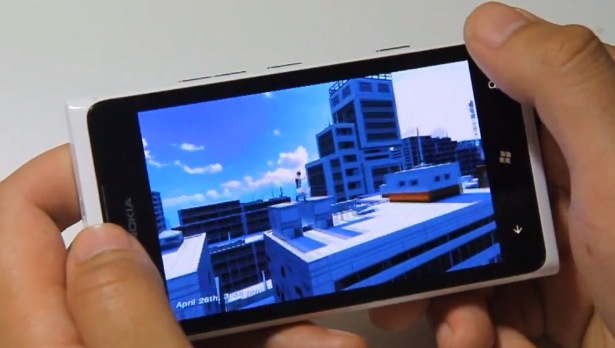 Nokia, however, doesn’t seem content with just offering a solid product and have decided to sweeten the deal by offering the amazing Mirror’s Edge from EA at no cost to Nokia Lumia 920 owners. The amazing action platformer from EA has been added to the Nokia Collection and are offering the normally $2.99 game for free. The game has also received an update to version 1.1.31.0 that now shows the new Xbox banner on the tile that hopefully also means we’ll see some additional Windows Phone 8 features in the near future. Is Nokia’s generosity making you want to pick the Nokia Lumia 920 even more? Is Mirror’s Edge a great freebie to an already-awesome device? Discuss in the comments below!